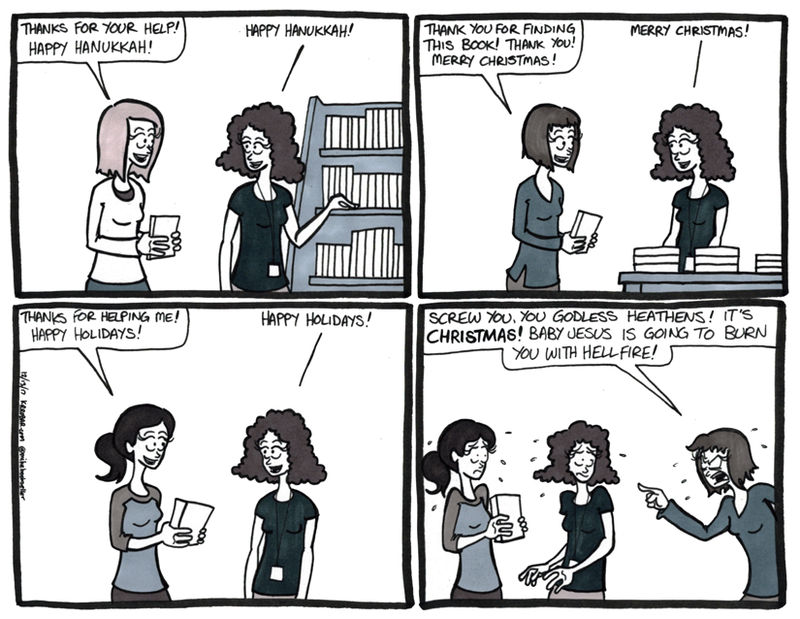 I’ve experienced a fair few insistent “Merry Christmas” wishes from customers. I really find no problem with “Happy Holidays” (except for the stupid song). There are quite a few holidays that happen around this time of year. A nice “Happy Holidays” is a small all inclusive seasonal greeting. No stepping on toes as far as I can tell. Then there are those out there putting their feet in areas to purposefully have them stepped on. Yes, Christmas happens every year. Yes, I will wish you a “Merry Christmas” if I am wished one as well. But look, Christmas isn’t going anywhere. The keeping “Christ” in “Christmas” is fairly pointless to force on people. If we want to get religious, from what I understand of Christianity, true Christianity, is love for all people. You can’t love someone if you’re holding this whole “you’re not being Christian enough” over their head.